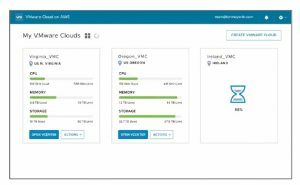 VMware have just announced a partnership deal with AWS that will allow the running of dedicated vSphere based services directly on AWS clouds. Customers can either integrate on-premises vSphere services with AWS cloud services, or have a hybrid model of on-prem and cloud vCenters. For example this would allow an vm running in a local datacenter to leverage AWS services on the backend. A single UI will bring together all these services included VSAN and NSX capability, along with access to AWS. NSX will span on-prem and cloud services. Full unnested dedicated ESXi servers will also be available as a AWS service, and VMware will take responsibility for infrastructure and support. Cross vCenter VMotion functionality will allow seamless movement of vms between on-prem datacenter and the cloud, some of this was hinted at in the release of cloud foundation in VMWorld US, but here we see the cloud and on-prem environments together in the Web client. What is going to be a huge sell is the ability to expand into the cloud on your own dedicated cloud infrastructure. All of AWS’s datacenter will be available as locations. By removing the difficult migration path back to your datacenter, the cloud becomes a lot more friendly. By simplifying the path into cloud services and adding the additional services provided by AWS this is a thunderbolt of a announcement for those trying to sell infrastructure as a service. Regardless of the scenario contemplated by virtualization consumers public cloud just got a lot closer to home.